“A leader…is like a shepherd. What a humble, yet profound and enlightening way to understand leadership: allowing the most talented people who have special gifts and abilities to lead the way. I shared about Mandela’s life, teachings and legacy, including his commitment to make life better for all people in South Africa—a commitment that was so firm that he was willing to die for it. 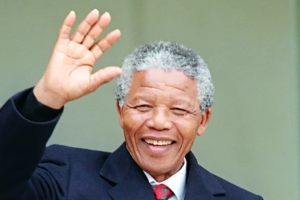 In this morning’s Gospel reading, Jesus called himself, “the Good Shepherd,” and his way of understanding shepherding seems to resonate with the life and words of Nelson Mandela. First of all, Jesus said that he, as the Good Shepherd, came to bring abundant life to all of the sheep. And we know from the Gospels that he meant all of the sheep, not just a handful of them, or just the best looking ones, or the ones who looked most like him. Secondly, Jesus said that the Good Shepherd has such great care and concern for his sheep that he lays down his life for them. Jesus was willing to lay down his life and die for the good of humanity—and he did exactly that. Finally, Jesus not only saw himself as the Shepherd, but also the gate. Switching metaphors as quickly as anything else, Jesus didn’t need to be the key figure that was always in the spotlight. He was just as happy being the gate! May we all appreciate the leadership of Jesus in his time in our own time, and may we seek to model our own forms of leadership after his.